James emailed to ask if I'd like to check out an Aloha Hawaiian Lei company's lei. I'm guessing he'd seen my luau grill out for my son's graduation. We had leis but just the plastic kind that you can get at the Dollar Store. He said he'd send one out if I'd like to see one and give an honest review (as always). I'm not sure if James was aware that I live on the east coast, and I wondered how a real flower lei would fare with that kind of trip. They have some of the pretty nut shell leis which would have been the safe way around that, but Aloha Hawaiian actually packed up a real flower lei and sent it to North Carolina. My son was home when the lei came in, and he put the box in the refrigerator as the box said perishable and keep cool or something along those lines. I carefully opened the box and lifted out the lei which was wrapped in soft paper and packed with an ice pack. The lei, as you can see above, was magnificent. Absolutely perfect. It also was in one of my favorite colors - purple (which the company could not have known). In addition to being beautiful, the Aloha lei smelled like flowers. I find that a lot of the fancy flowers these days do not smell like flowers or anything. This lei smelled like a flower garden. These Aloha leis are pricey. With real flowers and shipping, you would expect as much. 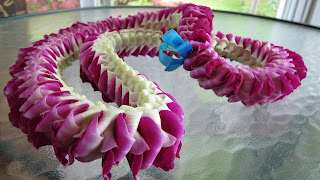 But, I would have to recommend Aloha Lei Company for a special occasion where you want real flower leis right from Hawaii. The leis are really special, and the company packs nicely and ships fast. I was not so sure a real lei would arrive this far away looking great, but it did. 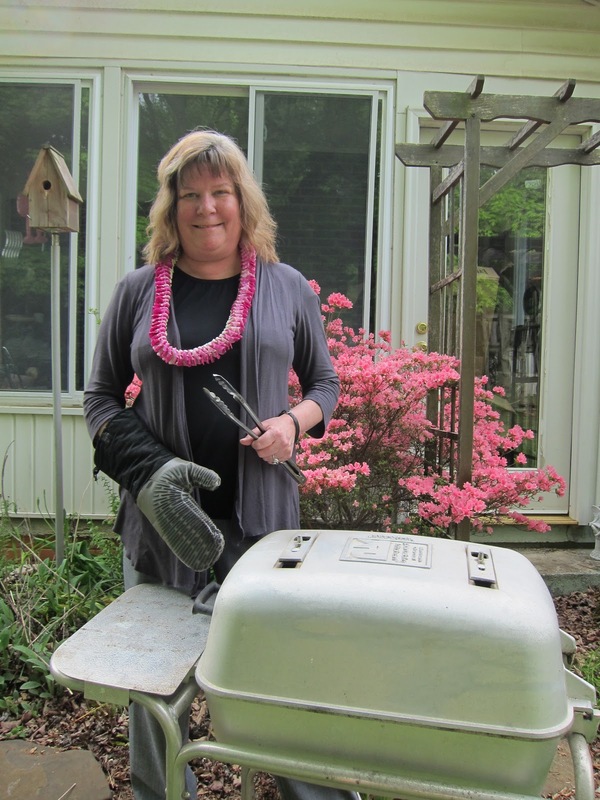 And, I enjoyed getting to wear something so pretty out there at the PK grill. What a wonderful touch to any special party!! What a fabulous picture of my most favorite person!! Very nice...the lei is beautiful and purple is the most awesome colour ever! That was a great review...the lei is beautiful and purple is the most awesome colour ever! I bet a real lei was so much better than the plastic one.